Use conditional field rules, logic, and branching to make useful and powerful forms. 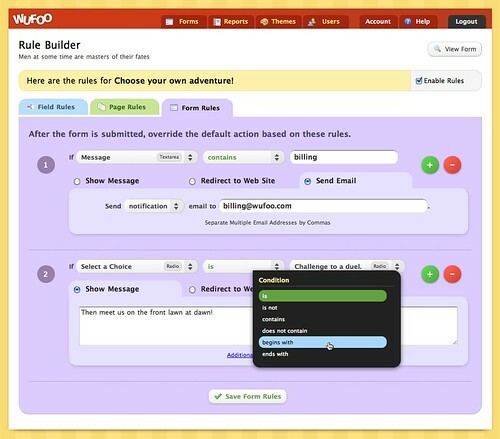 The Rule Builder is what will allow you to create dynamic forms based on logic you’ve designed to perform certain actions like showing and hiding fields, skipping certain pages or emailing specific individuals based on the selections the user makes while filling out your Wufoo forms. Understanding and creating rules is really easy in Wufoo. First of all, there’s no programming knowledge necessary. Our Rule Builder was designed to make adding and understanding the logic you want to apply to your forms as easy as creating simple sentences. If you’ve ever created rules for your email, then you’ll be really comfortable with our interface. 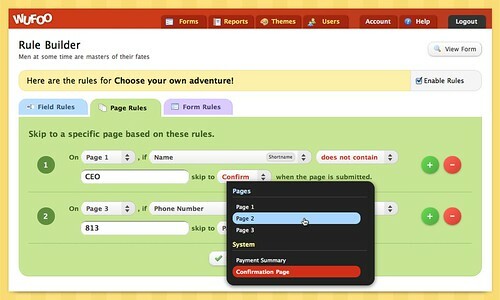 To get to the Rule Builder click on the Rules link under the form’s name in the Form Manager. 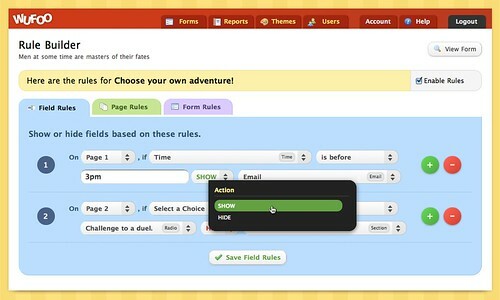 Once there, you can create three different types of rules: Field Rules, Page Rules and Form Rules. These rules are separated for your convenience and can be accessed by tabs located at the top of the Rule Builder. Each rule type performs different actions based on conditions you’ve created for evaluating the input entered by your users. Field Rules let you perform two actions if a condition is true. You can either SHOW a field to the user or HIDE a field from the user based on the value of another field. One thing that’s nice about these rules, is that the actions can happen in real time as the user is filling out the form. You can even SHOW and HIDE Section Breaks and File Upload fields, which is useful for displaying extended instructions for how to fill out your form or selectively asking for files from your users. Page Rules allow you to skip pages, skip payment or go straight to the confirmation page based on conditions you’ve created. With page rules, you’ll be able to create a custom path for your users ensuring they only see pages relevant to them during their form submission process. If you have users who want to choose to pay by check or invoice, you can now easily create a checkbox in Wufoo to base a condition off of and then set a page rule to simply skip the payment page if it’s checked. Form Rules let you take certains actions after your form’s been submitted. Form rules give you the flexibility to choose where your users should go after they submit your form. Form rules will override the default confirmation behavior and show a custom message based on the data they submitted or redirect them to a more relevant web page based on your conditions. You can also create smarter notification emails with form rules. For example, you can send a notification email to sales or customer service depending on the selection the user set in a drop down field in your contact form. If you are on a Free account, you can create Field Rules and Page Rules. Form Rules, however, are only available to Paid plans. Free accounts are also limited to creating only 3 rules total for each form (across Field and Page rules). You can see the number of rules you have left at the bottom of the Rule Builder. If you are on a Paid plan, you can create 50 field rules, 50 page rules and 50 form rules. It’s taken us a long time to come up with an interface experience we felt was worthy of the Wufoo seal of approval and so we hope you’ll enjoy all the details we’ve put into the Rule Builder. Many thanks go out to Alex and Ryan for putting in countless hours testing and debugging the system through an impossible number of oddball scenarios. It’s because of their due diligence that we can now increase the IQ of our Wufoo forms. We’re really proud of these new features and hope to show off some of the unique properties of our logic and branching system over the coming weeks.